This calendar contains the 2015-16 Gregorian calendar dates for all Jewish holidays for the Hebrew calendar of the year 5776, including festivals and days of mourning. In accordance with the Jewish calendar, the 2015 dates begin with Rosh HaShanah, which is the primary Jewish New Year among the four actual "new years" in Judaism. Holidays begin at sundown on the evening before the dates listed. The dates in bold represent the days with restrictions like those of Shabbat (e.g., with prohibitions against work, kindling fire, etc.). 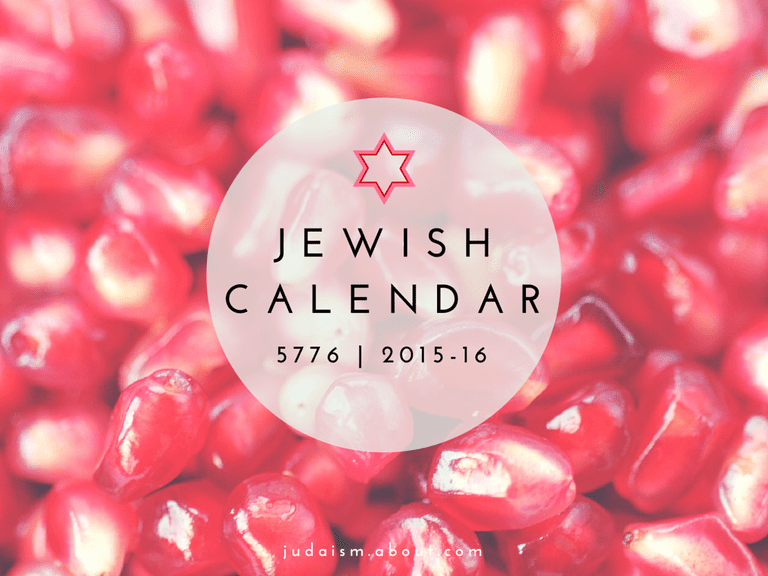 The year 5776 is a leap year, which you can read more about below the chart in how the Jewish calendar is calculated. On average, the moon revolves around the Earth every 29.5 days, while the Earth revolves around the sun every 365.25 days. This amounts to 12.4 lunar months. Although the Gregorian calendar abandoned the lunar cycles in favor of months of 28, 30, or 31 days, the Jewish calendar holds to the lunar calendar. Months range from 29 to 30 days to correspond to the 29.5-day lunar cycle and years are either 12 or 13 months to correspond to the 12.4-month lunar cycle. The Jewish calendar accommodates for the year-to-year difference by adding in an additional month. The additional month falls around the Hebrew month of Adar, resulting in an Adar I and an Adar II. In this type of year, Adar II is always the “real” Adar, which is the one in which Purim is celebrated, yarzheits for Adar are recited, and in which someone born in Adar becomes a bar or bat mitzvah. This type of year is known as a “pregnant year," Shanah Meuberet, or simply as a "leap year." It occurs seven times in a 19-year cycle during the 3rd, 6th, 8th, 11th, 14th, 17th, and 19th years. Additionally, the Jewish calendar's day begins at sundown, and the week culminates on Shabbat, which is a Friday/Saturday. Even the hour in the Jewish calendar is unique and different than the typical 60-minute structure most know.